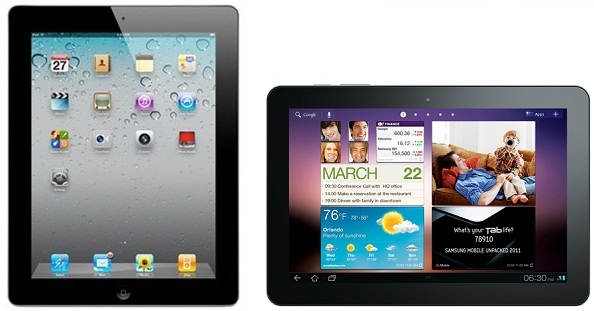 As the tablet wars are just beginning, what device will you choose? Samsung has been doing relatively well with their success on mobile touch screen devices, but Apple has proven their dominancy throughout the past years. Samsung has recently refreshed their beloved Galaxy Tab and has many attributes where it trumps the iPad 2. But overall, which device will fit your lifestyle better. What will your iPad be used for and the price differences that should be considered. Also, don’t forget the cost of 3G service can start to add up. Remember, that this is only a comparison of hardware. The user experience will differ, the iOS tends to be more user friendly than the Android; however, the Android boasts more of a “geeky” experience. Don’t forget the apps, the App Store has a plethora of apps in contrast to the Marketplace.